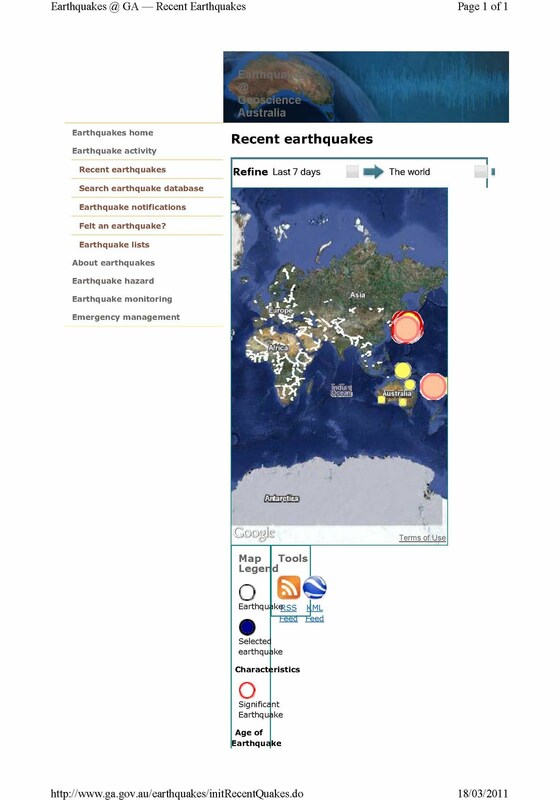 Denley Diaries: Earthquakes in Australia? You betcha! 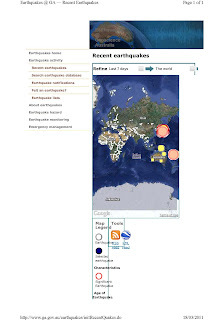 Earthquakes in Australia? You betcha! I remember when Newcastle had an earthquake. I was in the city on an outing with my Nana purchasing ice creams when the 'Streets' guy, who was listening to his walkman at the time exclaimed "Oh my goodness, Newcastle has just had an earthquake" to which my Nana replied "Oh that's nonsense. We don't get earthquakes in Australia!". It must have been the only time Nana was wrong, because when we got home, she turned on the news and there it was again. Yes, Newcastle had indeed suffered an earthquake. Recently, Mother Earth has gotten a little jumpy at the surface, and managed to move Japan 2.4 metres, and is still shaking that poor Island. Other areas in the Pacific Ring are being shaken up as well, and even Australia has had a tiny taste. This site holds the fascinating information (my picture to the left just doesn't do it any justice, but you can find it at the link below). Big dots with big red rings around them are NOT good. Look at all the ones surrounding Australia!